The Brock Commons Tallwood House at the University of British Columbia (UBC) is nearing completion. This 18-storey timber hybrid residence in Vancouver will be the tallest contemporary mass-wood building on the planet. It is the first mass-wood, concrete, and steel project taller than 14 storeys. As part of UBC’s mandate to increase student housing on campus, Brock Commons will have living capacity for more than 400 upper-year and graduate students. Each unit contains a kitchen and bathroom, with floorplans ranging from single-bed studios to four-person accommodations. Study and social spaces will be located on the ground floor with a student lounge on the 18th floor, where the wood structure will be left exposed for demonstration and educational purposes. Vancouver’s Acton Ostry Architects designed the building in collaboration with structural engineer Fast + Epp, along with tall wood advisor Architekten Hermann Kaufmann of Austria. UBC Properties Trust is managing the project. 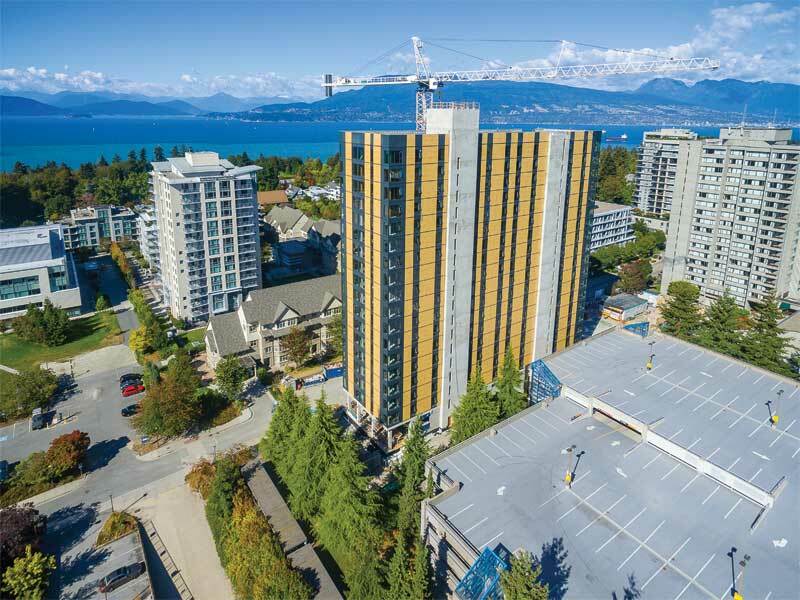 The 18-storey Brock Commons Tallwood House at the University of British Columbia (UBC) in Vancouver will be the tallest contemporary mass-wood building on the planet. Its project team includes Acton Ostry Architects, structural engineer Fast+Epp, and tall wood advisor Architeckten Hermann Kaufmann of Austria. The Brock Commons building is a hybrid structure; it has a concrete podium and two concrete-stair cores, with 17 storeys of cross-laminated-timber (CLT) floors supported on glued-laminated (glulam) wood columns. 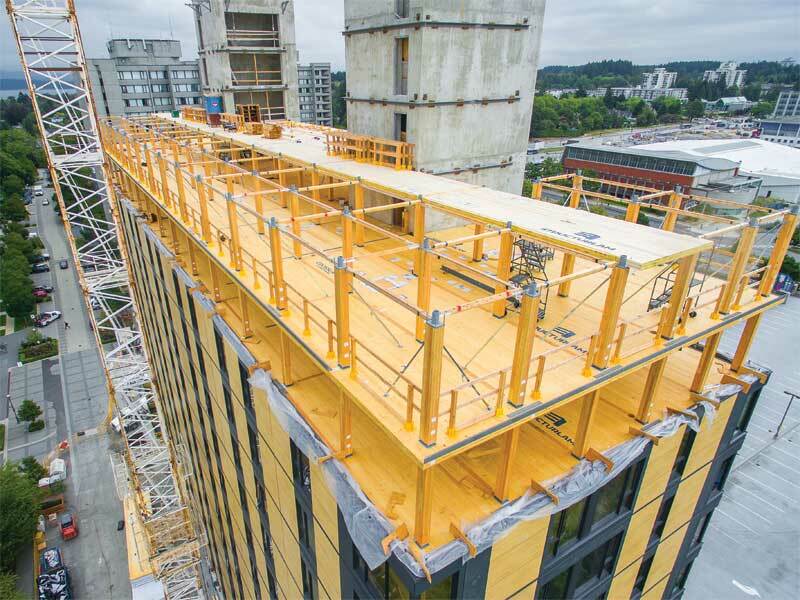 (For more on CLT, see previous Construction Canada articles like “Seismic Design with Wood” by Jim Taggart, FRAIC, and “Building with CLT: New Applications for Wood Structures in Ontario” by Kate Salmon. For more on glulam, see Taggart’s “Trees in the Tower: Designing the Surrey Memorial Hospital Critical Care Tower.”) The podium level is wrapped with curtain wall glazing and glass spandrel panels. An extensive CLT canopy runs the length of the building. The main structure was completed in less than 70 days. The prefabricated mass-wood components, supplied by a Penticton, B.C.-based company, were delivered to the site in a just-in-time process as the structure was assembled. (“The panels arrived in Vancouver ready to be assembled like puzzle pieces, allowing for swift construction. We loaded them on the truck in exactly the same way the installer was going to pull them off, so basically they pulled the panel off the trailer on the site, and put it in place,” explained Bill Downing, president of Structurlam Products, which supplied the CLT panels and glulam for the project.) This allowed for efficient material-handling and avoided onsite storage. Construction is currently being focused on interior elements, with completion expected around the time this magazine is published—four months faster than a typical project. The building is expected to open this summer. In light of the recent London tragedy how can such a building be a good idea? The issue with Grenfell Tower was the polyethylene filled aluminum exterior cladding. The structural materials discussed in these articles have passes all North America and European fire tests. Furthermore, they are always in modern, fully-sprinklered buildings.